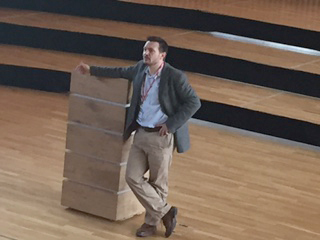 King Edward VI School Birmingham hosted two outstanding lectures in its Performing Arts Centre on Thursday 30 June. The first was on Gravitational Waves by Andreas Freise, Professor of Experimental Physics at the University of Birmingham. The second, on The Higgs Bosun and The Large Hadron Collider was given by Alan Barr, Professor of Particle Physics at The University of Oxford. Schools attending were: Bishop Milner Catholic College, Dudley; Joseph Leckie Academy, Walsall; Perryfields High School, Sandwell; Shire Oak Academy, Walsall; St Francis of Assisi Catholic Technology College, Walsall. 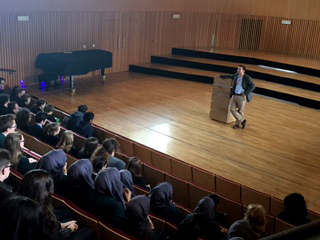 The lectures were sponsored by Physics Partners from a generous grant by The Mercers Company. This event was one of a number sponsored by Physics Partners and The Mercers Company and organised by this Birmingham schools’ partnership. Others this year have been hosted by the member schools and have featured presentations by teachers on the teaching of various aspects of Key Stage 3 Physics.